See Miami from the water as you relax on a 21-foot (6.4-meter), 6 passenger jet boat through the waterways of Biscayne Bay and along the coast. For 90 minutes, feel excitement with the wind in your hair and the warm Florida sun shining down from above. From the water, you’ll see the Miami city skyline and several historical sights, and you’ll pass by some of the area’s most stately homes. For 90 minutes, you'll speed through the waterways of Biscayne Bay and along the Miami coastline. Your tour begins with a short safety and awareness lesson about boating. Then, take a seat and get ready to zip across the water! 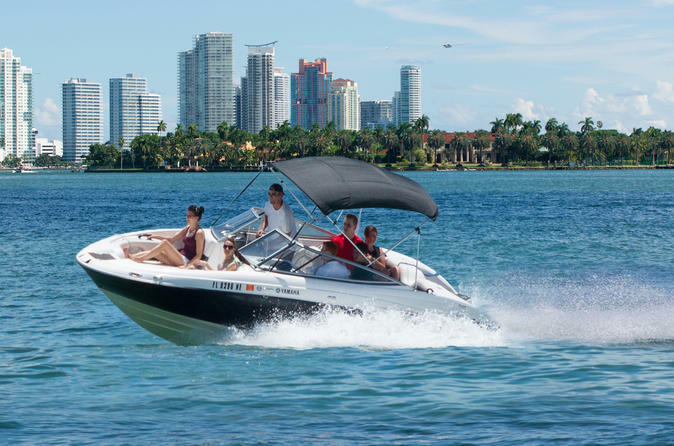 Your 21-foot mini speedboat is safe, fun and easy to ride, making it a perfect way to see the sights of Miami. Your trained and knowledgeable guide will point out parts of Miami that would otherwise go unnoticed throughout the tour.